Bouncing Buttons crafts making it simple: Sewing progress. I now have 7 fitted diapers sewn. I am a bit worried because I don't have marks showing my snap placement. I hope I can get them marked OK when I get some tiny snaps. I guess if I can't I can just add some hook and loop on them. 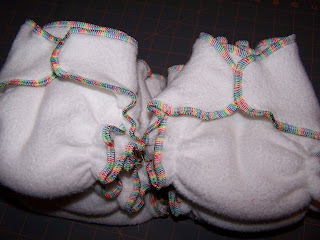 Once I get 1 dozen done I am going to take a break and make some cloth wipes. I am sewing a LOT better on corners with my using this machine I hope to get even better with making a stack of baby wipes. I feel 7 diapers is a wonderful amount of progress to make in a very short time. I am not very good at sewing so this is a huge step for me!